Some people consider the Midwest to be a flyover region, meaning there’s not much to explore. We’re not those people. We emphatically believe the 12 states that make up the Midwest hold some of the most perspective-shattering views throughout the entire U.S. That’s definitely a bold statement considering this region is backlit by some extremely beautiful places. Landscapes to live up to like Yellowstone in Wyoming and Glacier in Montana. Or metropolises that are pretty difficult to hold a candle to like New York City and Boston. But you know what we say to people who so staunchly favor those sights over the Midwest? What about the Great Lakes and the Badlands? What about Chicago? These are wonderfully stunning places, too. We would be struck with remorse if we didn’t do our best to shout from the rooftops about all these countless Midwest treasures. Ultimately, we want to say that the American Midwest should not be so quickly dismissed as “flyover.” Because on top of all the big cities here, you’ll find a slew of lesser-known gems scattered throughout that we bet you’d be dying to see if you knew about them. Luckily for you, we’re going to tell you about a few treasures to look out for; so prepare for an eyeful, here’s the best of the Midwest. These three words will change the way you feel about the Midwest: Sleeping Bear Dunes. Enter that into Google and see what comes up. The herculean Lake Michigan challenges your perception. You’ll be questioning whether or not you’re viewing the open sea with all that seemingly infinite water laid out before you. Couple that with scenes of joyous people artlessly tossing themselves down honey-colored dunes that fall right into the bluer-than-blue lake below and you pretty much know what Sleeping Bear is all about. In other words, you’ll be enraptured by colorful earth within a sea of smiles. If you don’t have too long to discover the area then head to the Phillip A. Hart Visitor Center first. This place will get you set up with maps and an intro to the park. They’ll most likely tell you to take the Pierce Stocking Scenic Drive because it gives you a quick but satisfying look into the magnificence of Sleeping Bear. The name itself conjures up images of Mars, or some strange dream you maybe had as a kid. At sunset, get here to experience the rainbow-layered buttes of Badlands National Park and one of those things will probably still be coming to mind. This park elicits fervor in people that’s unrivaled – possibly because they don’t expect such immense beauty in South Dakota. But it’s here. "Mako sica" means “land bad” in the Native American language, Lakota. “Les mauvais terres pour traverse" means "bad lands to travel through" in French. It’s no coincidence the name stuck what with the rugged terrain and lack of water. Still many animals thrive here (e.g., prairie dogs, mule deer, bison, bighorn sheep and coyotes). And many once thrived here: Walk where saber-toothed cats and rhinos used to roam. You’re also welcome to drive. 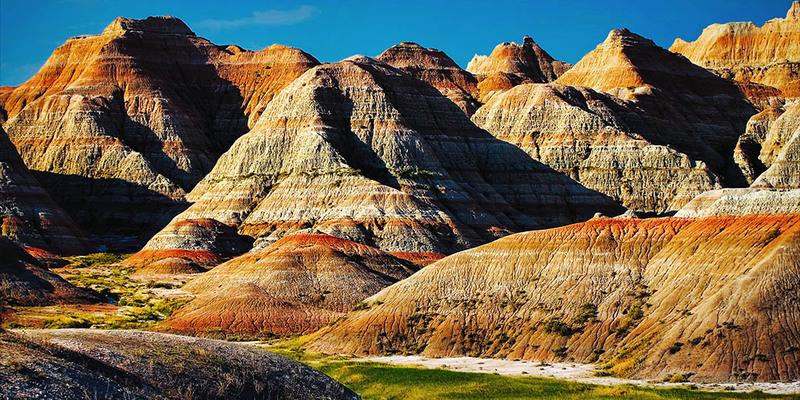 Badlands Loop State Scenic Byway (SD 240) is the most breathtaking route, and consistently rated as a top-ten scenic drive. Don’t leave here without hiking the Notch Trail though. It’s a one-and-a-half-mile (round trip) hike that finishes with captivating views of the White River Valley. Have you ever heard of the Apostle Islands in Northern Wisconsin? No? Well, let us paint a picture for you. Imagine a patch of summer air being passed back and forth between waves. As the sun slowly gains height above Lake Superior, beams of fiery orange light meet with this sweet-smelling air. And before it’s carried to shore, with every cycle of crest and trough in the wave, the patch of air becomes more fragrant, now thick with a balmy heat. Eventually the breeze finds a home in a cave built from age-old sandstone. You come up from the depths of Lake Superior only to be met with this intimate current of air and that utterly enchanting smell. Welcome to the windblown, cliff- and cave-drenched, forested masterpiece of nature that is Apostle Islands National Lakeshore. What we just painted for you was a summer day full of scuba diving amongst sandstone caves. You’re welcome. Now for a little break from the wild scenery we just decorated your mind with and right on into the city. Chicago is equal parts grit and grace. It can be seen as the backbone of the Midwest plus its oceanic shoreline is pure poetry for the eyes. You’ve heard of Sears Tower, we’re positive (AKA Willis Tower). It is the third tallest building in the world after all. But what you possibly haven’t heard about is The Ledge. This is essentially a glass box housed in the 103rd floor observation room. It towers over the city. You’ll be pleased to know you can experience second-to-none views of the Windy City, just about 50 miles worth on a clear day. Don’t worry, The Ledge is made of one-and-a-half inches of glass and can support up to 5 tons. There you have it, four lesser-known experiences in the great Midwest. Now it's time to find a reason to visit (hint: find a Midwest locum tenens assignment right here). After you do that, set out exploring in the above-mentioned places. Maybe you can even seek out some unique experiences that aren’t on the list. In fact, we’d love to hear if you have any sites you’d recommend, too, in the comments below. Happy travels!